Robert Baden-Powell, the founder of World Scouting, introduced the idea of Boy Scouting to the British public with the 1908 publication of his book SCOUTING FOR BOYS. 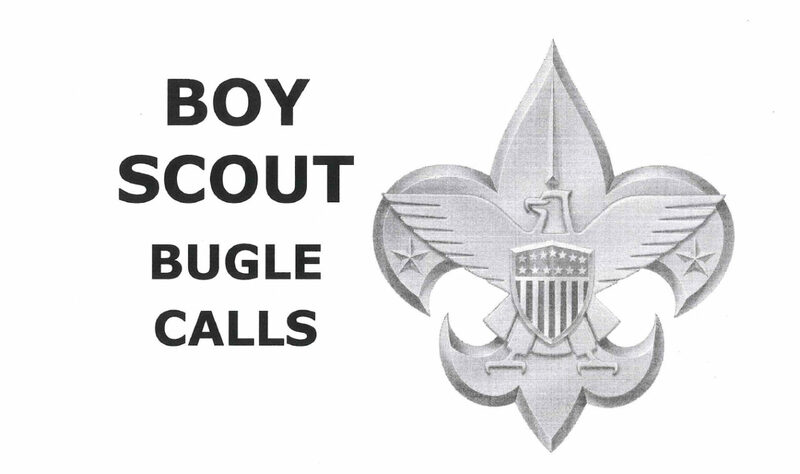 On page 44 of that book, he included the music for â€œThe Scoutâ€™s Callâ€ with the caption “For scout master to call together his troop by bugle.” Bugles were a part of Scouting at its beginnings and have been a part of Scouting ever since. This is a compilation of information on bugles and Scouting. Robert Baden-Powell, the founder of World Scouting, introduced the idea of Boy Scouting to the British public with the 1908 publication of his book SCOUTING FOR BOYS. 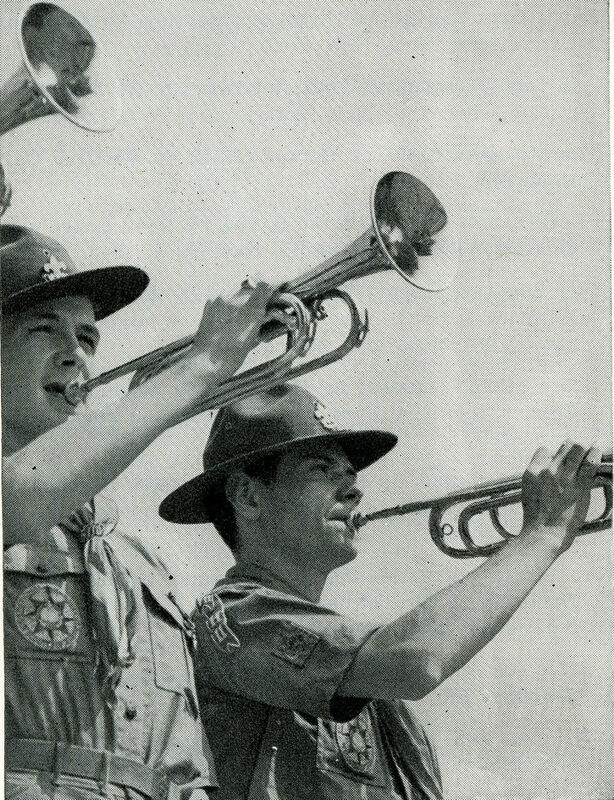 On page 44 of that book, he included the music for â€œThe Scoutâ€™s Callâ€ with the caption “For scout master to call together his troop by bugle.” Bugles were a part of Scouting at its beginnings and have been a part of Scouting ever since. 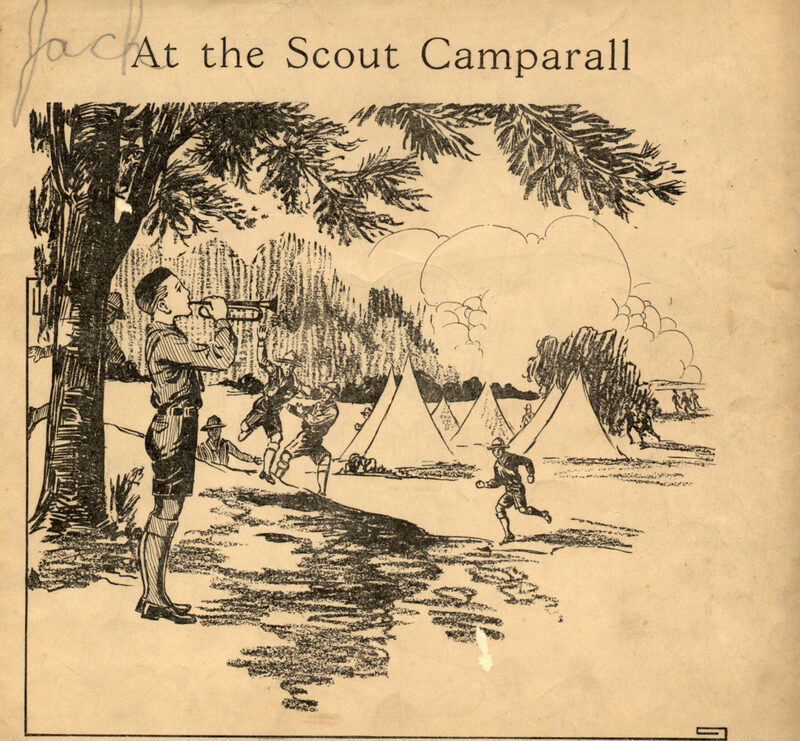 The illustration above from the cover of an early Boy Scouts of America MUSIC AND BUGLING merit badge pamphlet shows a Boy Scout bugler playing â€œThe Scoutâ€™s Call.â€ Just a few years after Scouting was founded, London Boy Scout buglers were called on to serve their country by riding on their bicycles and in vehicles sounding the all clear after World War I air raids. A 1929 article in the TIMES OF LONDON recalled the end of World War I being marked by â€œthe shrill reverberation of a Scout’s bugle sounding the â€˜All Clear,â€™ which had become familiar to London after many an air raid and was now, by a very British turn of symbolism, announcing that the Armistice had been signed.â€ This image of London Scout buglers serving their country was circulated around the world. Very soon after Scouting was founded in England, it spread to other countries around the world, and the use of bugles in Scouting spread with it. 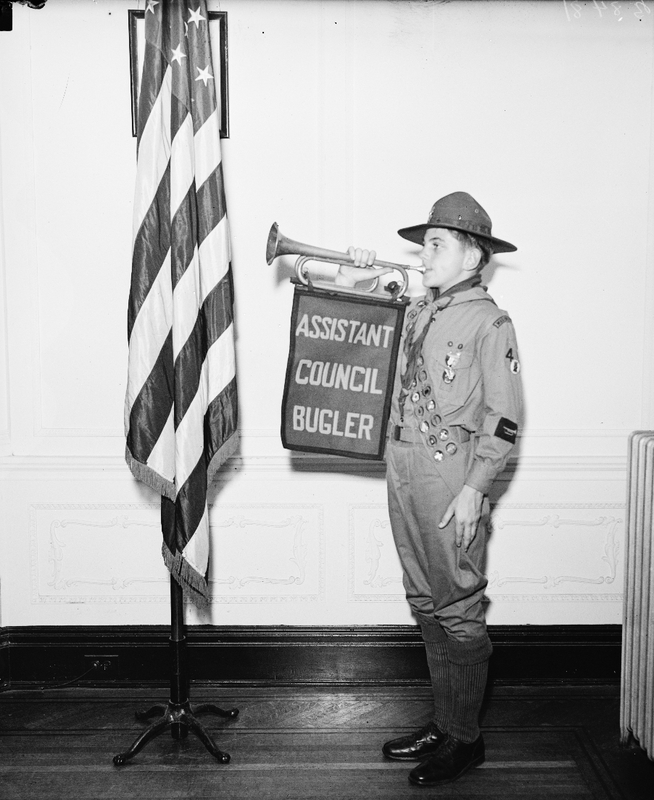 All around the world, the general public began to associate bugles with Scouting. Boy Scouts were such an important feature of everyday life that they began to appear on postage stamps, and bugles appeared with them. The first postage stamp to picture a Boy Scout was a 1925 Hungarian stamp issued as part of a sports series that showed a Scout bugler in the foreground and a camping scene in the background. It is the second stamp in the second row below. Since then, a number of countries have pictured Scout buglers on their stamps. 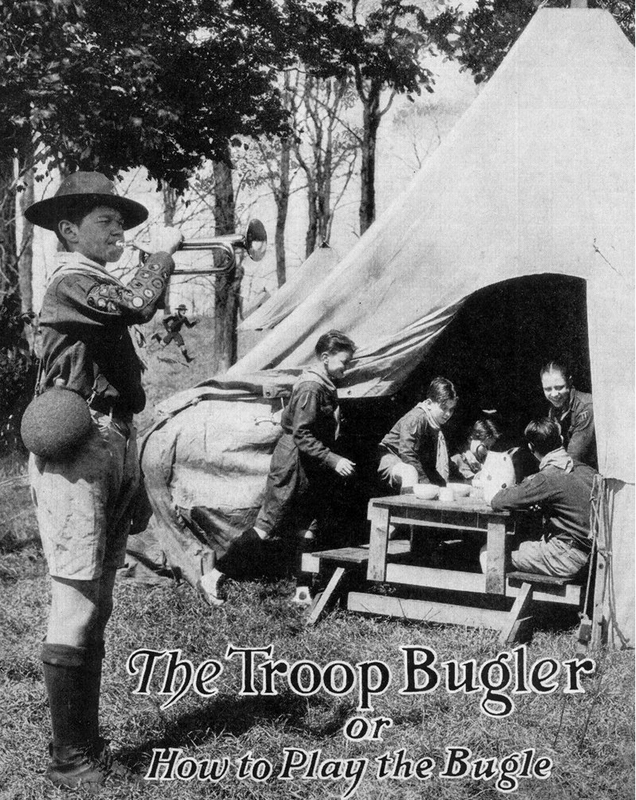 Scout buglers have also appeared on cigarette cards, postcards, and magazine and sheet music covers, and as lead and plastic toy figures and game pieces. 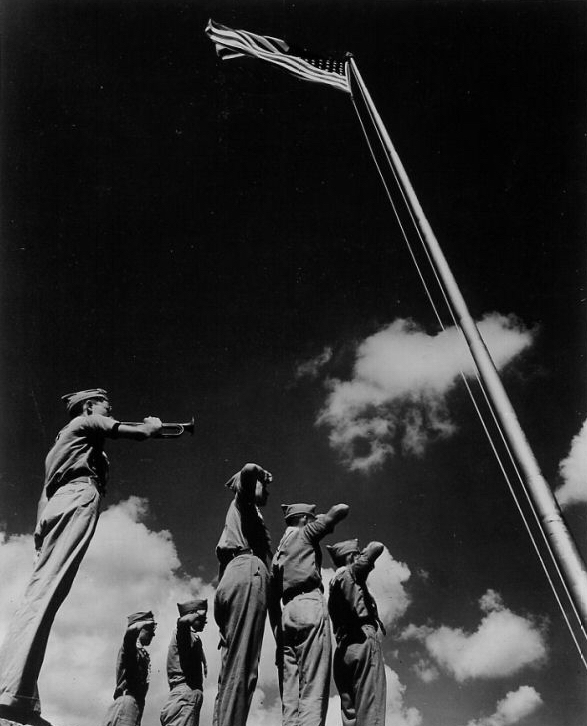 On May 1, 1919, President Woodrow Wilson issued a proclamation that commended the Boy Scouts of America for â€œnotable service to the Nation during the world warâ€ and stated â€œThe Boy Scouts have not only demonstrated their worth to the Nation but have also materially contributed to a deeper appreciation by the American people of the higher conception of patriotism and good citizenship.â€ He then urged Americans to support the BSA financially and by volunteering as leaders and stated:Â â€œThe plan, therefore, for a Boy Scout week, during which a universal appeal will be made to supply the means to put the Boy Scouts of America in a position to carry forward effectively and continuously the splendid work they are doing for the youth of America, should have the unreserved support of the Nation. Therefore, I Woodrow Wilson, do hereby recommend that the period beginning Sunday, June 8th, to Flag Day, June 14th, be observed as Boy Scout Week throughout the United States for the purpose of strengthening the work of the Boy Scouts of America.â€ The BSA issued a Boy Scout Week poster with President Wilsonâ€™s proclamation on the back and a front, shown below, that featured an illustration of a Boy Scout in uniform sitting on a porch playing a bugle. The distribution of this poster coincided with the publication of the May 15, 1919, issue of LIFE magazine with the same illustration on its cover that is on the poster. There was no information inside the magazine about the cover. 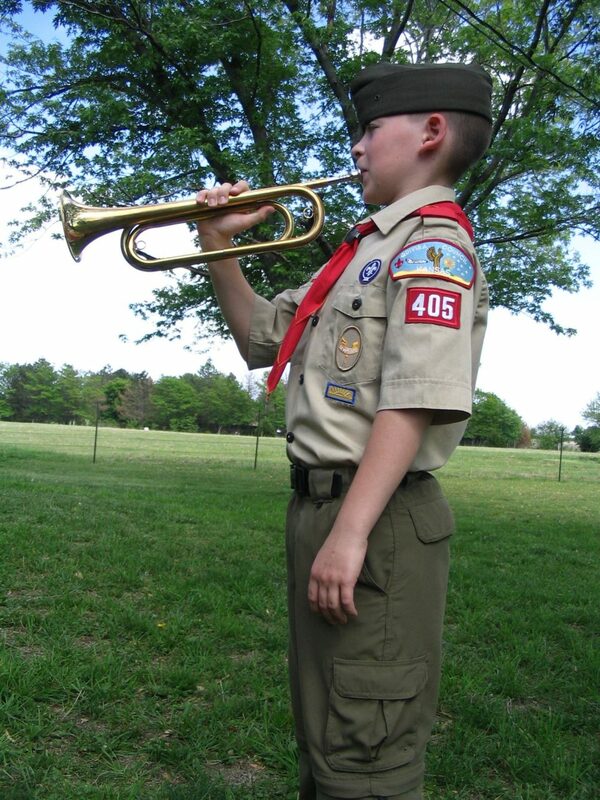 People knew this was a Boy Scout playing a bugle. 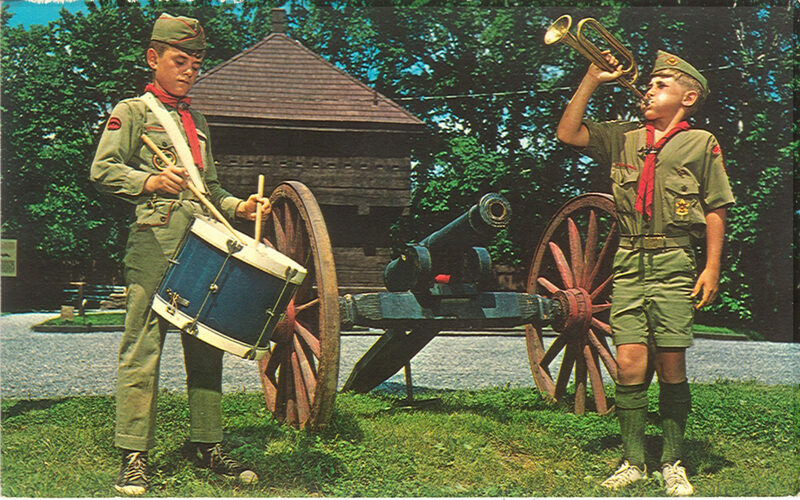 As Scouts in different countries began to play bugles, they would typically use the type of bugle that was used by the military in their country. For Scouts in Europe and the British Commonwealth, this was a true â€œbugle,â€ which has a conical shape throughout. For Scouts in the United States, this was what is technically called a â€œfield trumpet,â€ which looks like a trumpet without valves, in which 2/3 or more of its length is a cylindrical tube. The photos below shows an English bugle presented to one of the All Clear buglers of World War I on the left and an American King Official BSA bugle on the right. The difference is very noticeable. 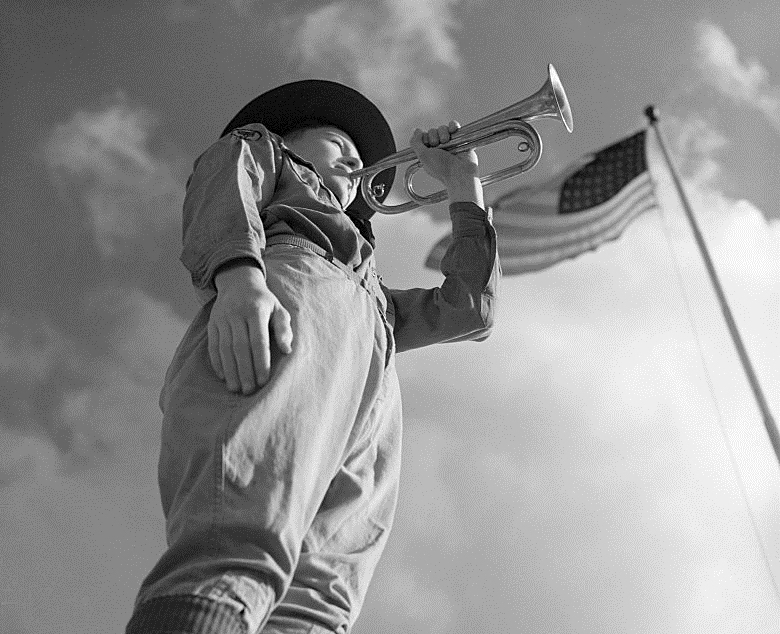 Bugles from the authorâ€™s collection The popularity of bugling among American Boy Scouts meant there was a demand for bugles, and BSA met that demand. 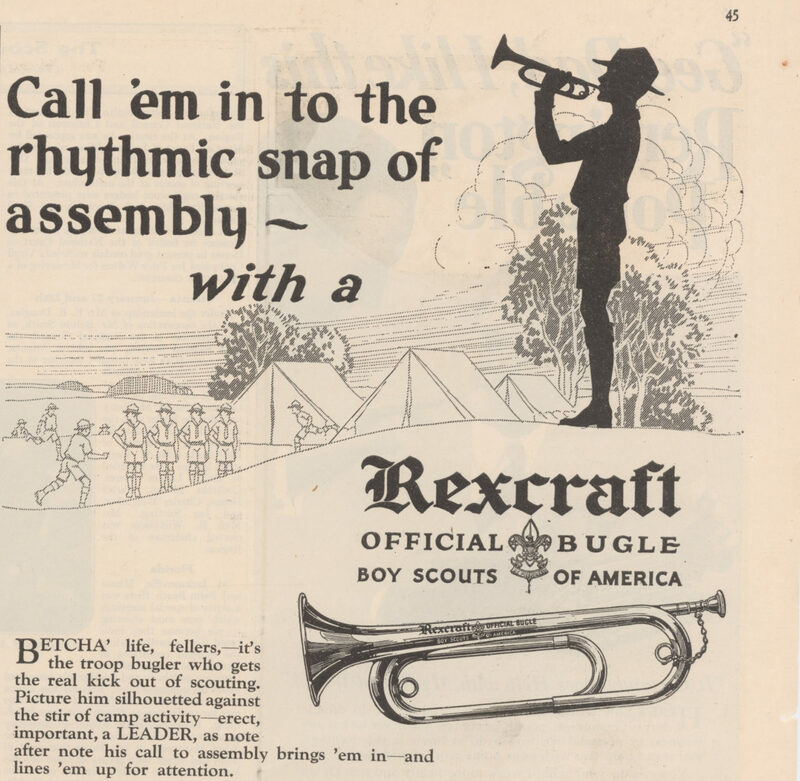 Bugles first appeared in BSA catalogs in 1913, and by the late 1910s some bugles sold by the BSA had the engraved inscription OFFICIAL BUGLE BOY SCOUTS OF AMERICA. While bugles with an engraved â€œBoy Scoutâ€ of â€œScoutâ€ inscription were marketed to Scouts in several countries, I know of only two other national Scout associations that sold â€œofficialâ€ Scout bugles to their members, the Girl Scouts of America, and the Boy Scouts of the Philippines. This entry was posted on Friday, October 21st, 2016 at 7:30 pm	and is filed under Bugle Stories, Buglers Through History, Bugles for Performing and Collecting, General Interest, Getting Started on the Bugle, History of Taps. You can follow any responses to this entry through the RSS 2.0 feed. You can leave a response, or trackback from your own site. I recently acquired a Rexcraft Official BSA bugle (brass) with the First Class emblem mostly on the top (but not directly) of the instrument. Is there a way to identify it’s model and more so it’s age? Thank you Joni S.